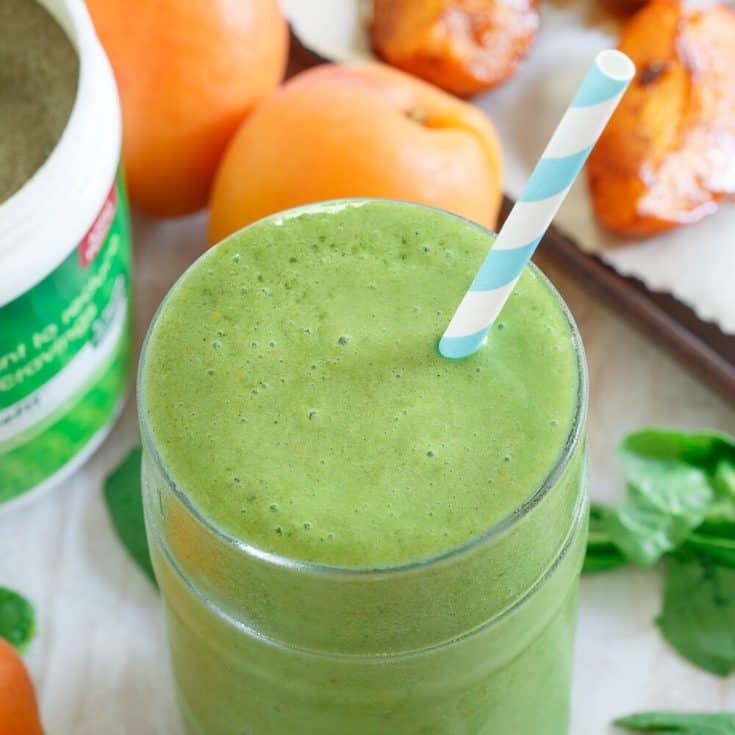 This roasted apricot smoothie gets a healthy green boost with spinach and natural spinach extract to help keep you feeling full longer! If you know me at all in real life (although I bet it’s pretty evident even just online too), you know I have the patience level of a small child. When I want something, I want it now and it frustrates me to no end when I have zero control in making it happen. This post is sponsored by Vitamin Shoppe. In the simplest of terms, the year as it relates to food is broken down into two parts in my mind: peach season months (yay!) and non-peach season months (boo!). There’s really no other fruit that even comes close to my beloved peaches. But here we are in May and despite the fact that they’re popping up in the stores now, we all know the truth; buy a few and be sorely disappointed in the mealy disgustingness that will likely greet you in your mouth due to the fact that it was likely picked from a tree in some south American country when still hard as a rock unripe. I happily obliged thinking they’d suffice as a peach stand-in for now, threw them in the cart and went about my shopping. Later that afternoon, I cut one up and ate it in my pre-workout bowl of oat-bran (yes, I’m like 90, I love oat-bran) and was floored at how sweet, juicy and just overall delicious it was. That’s when roasting them to make an apricot smoothie (in green form of course!) hit me. Let’s be real, green smoothies can be, well, very green tasting. It’s pretty and all, but if it tastes like you’re drinking liquid kale or spinach, looks don’t go very far. Kids, mom was right. Looks aren’t everything. I can promise you though, this green smoothie tastes nothing like that. 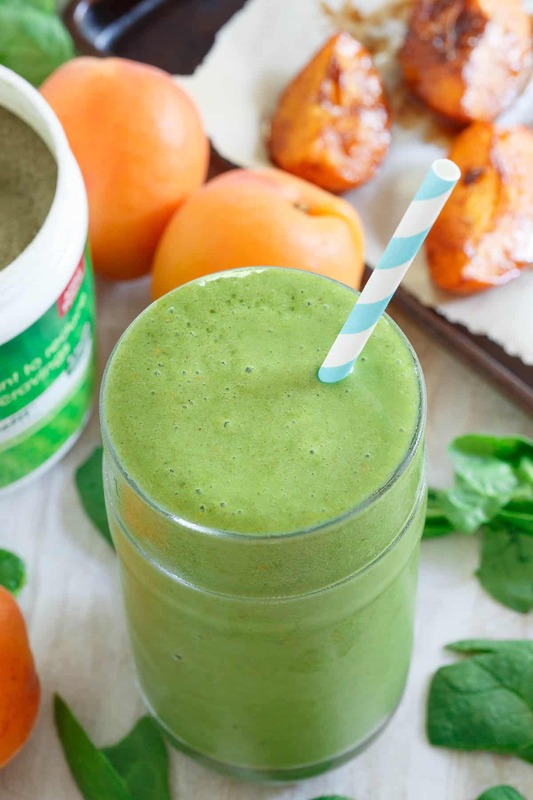 With roasted apricots tossed in vanilla bean paste, cinnamon and sea salt and a scoop of Vitamin Shoppe’s new AppeFIT apple punch, the spinach in this apricot smoothie wouldn’t even be detectable if it weren’t for its bright green color. Prefer your smoothie in a bowl? Check out this Avocado Pineapple Smoothie Bowl – yay toppings! Wondering what AppeFIT is? 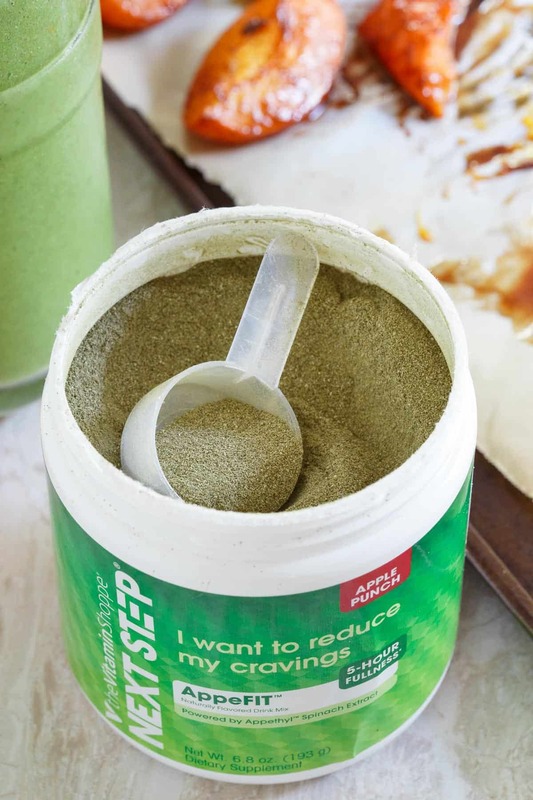 It’s a supplement derived from all-natural spinach extract (appethyl) which may help fight hunger by slowing the digestion of fats and keeping you feeling full for longer. It’s not a meal replacement at all (not a fan of those), just an all-natural (as well as gf, dairy free, soy free and sugar free) addition to whatever you’re currently eating (make sure there are some fats in there for it to do its thing best) and makes a great add-in for smoothies! While I seem to be in a constant state of hunger these past 6 weeks (thanks to a cutting diet currently), I am able to at least not *think* about my next meal for every minute of the next 3-4 hours when I use AppeFIT, and for that, I’ll call this a win. Toss apricots, cinnamon, sea salt, vanilla bean paste and coconut sugar together in a small bowl. Spread out in an even layer on the baking sheet and roast for about 15 minutes until softened and starting to caramelize. Remove from oven and set aside to cool. Combine remaining ingredients in a blender, add cooled apricots and blend until smooth. *A scoop of vanilla whey protein powder (or other protein powder) would be great in this as well for an added protein boost. Okay, I am with you–I would totally typically opt for peaches over apricots. However, now I have apricots on my list–roasting them is genius. I could eat them just like that, but this smoothie sounds great as well. Full of so much goodness and flavor, his looks amazing! The peaches at the store yesterday were taunting me with their pretty color, jerks. I resisted because you and I both know they’ll be either sour rocks or mealy mush right now. Until it’s that wonderful time of the year again, these roasted apricots sound like the perfect alternative! I need to try AppleFIT in my smoothies, it sounds like a great alternative and better flavor that a bunch of spinach and kale blended in. Oh I love peaches way too much. I like apricots too, and I’m always looking for ways to use them because my neighbor has a very prolific tree! I’ve never heard of the apple punch podwer, have to try it! Such a nice idea to roast the apricots first. 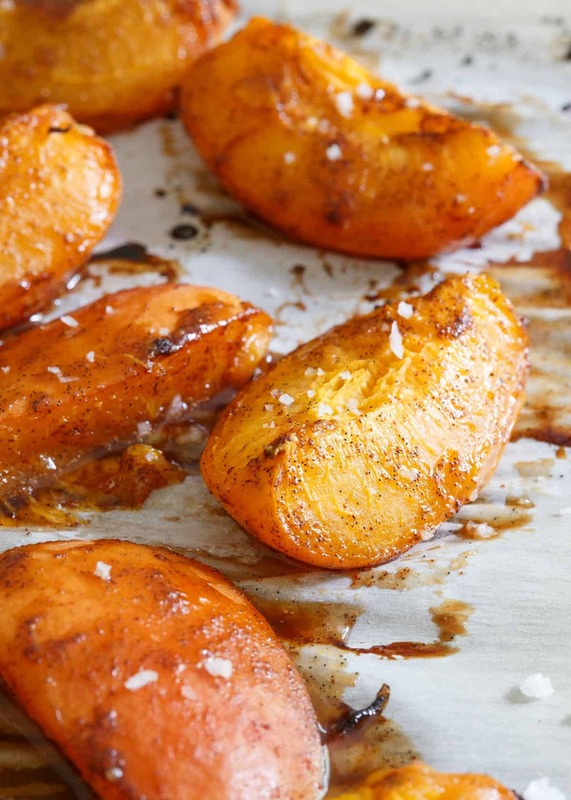 Those roasted apricots are gorgeous! Which a delicious smoothie. Whoa, those roasted apricots are calling my name! I bet they taste fabulous in these yummy smoothies! This is a green smoothie I can get behind!! That’s look tasty ! looking for best intuitive eating and health discussion. Hit my up! Cheers! 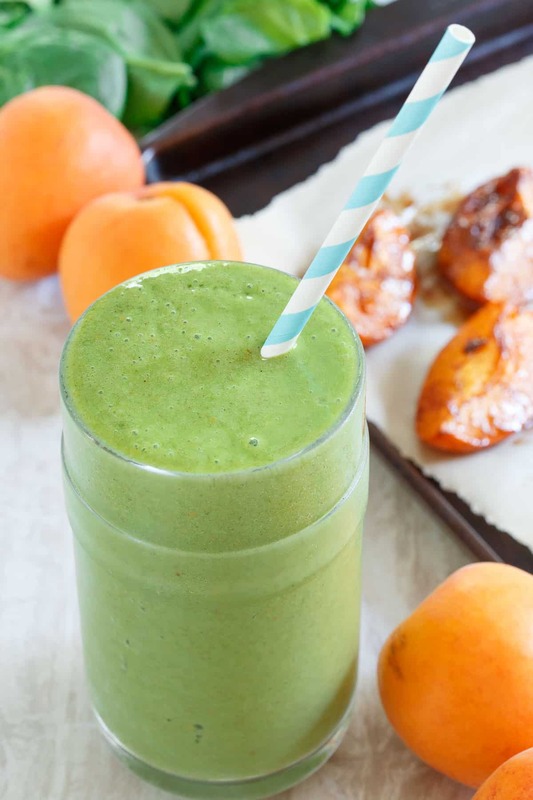 You know I LOVE roasted apricots but I might love them even more in green smoothie form. Delicious! What is the difference in roasting the apricots?? Does it change the flavor/sweetness level of the smoothie? It definitely helps sweeten them up and bring more depth of flavor to the fruit & smoothie!